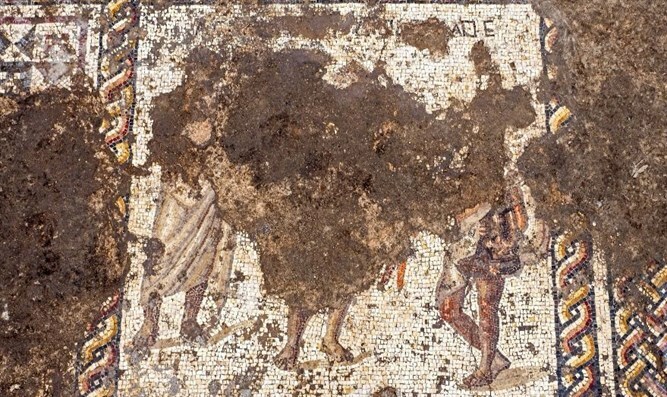 Well-preserved Byzantine-era mosaic discovered in national park in Caesarea. JTA - An 1,800-year-old Byzantine-era Roman mosaic bearing an inscription in ancient Greek was discovered at a national park in Israel. The multicolored mosaic was unearthed in Caesarea National Park during an archaeological excavation as part of a conservation and reconstruction project by the Israel Antiquities Authority and the Caesarea Development Corp., in cooperation with the Israel Nature and Parks Authority. The dig, part of reconstruction work on a Crusaders-era entrance bridge to Caesarea and the construction of a promenade for visitors, uncovered part of a large, opulent building dating back 1,500 years to the Byzantine period. Archaeologists discovered the mosaic under the Byzantine-era structure, likely used for commerce and social events, from an even earlier building dating back about 1,800 years, the Antiquities Authority said in a statement. They said it is not known who the figures represent; it may depend on what the building was used for. The Israel Antiquities Authority Conservation Administration is now working to ensure that the exposed parts of the mosaic are preserved properly. The area of the bridge is also being replanned to make the mosaic accessible to the public, according to the authority. Along with the Caesarea Development Corp., the park project was underwritten by the Edmond de Rothschild Foundation.